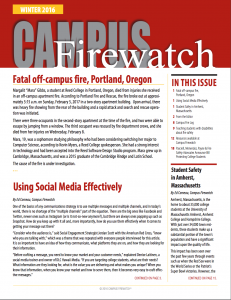 The latest edition of Campus Firewatch is out! Fatal off-campus fire – Information on the fire that claimed the life of Reed College student Mara Gibbs. Using social media effectively – This article features interviews with social media experts from the USFA, NFPA, American Red Cross and others. Fire safety in Amherst, Massachusetts – Amherst is the home town of three colleges and faces many of the same problems as other communities, including over crowding, student behavior issues and much more. I talked with the town’s liaison officer, building inspector and assistant fire chief to learn more about how they are addressing these issues. Teaching students with disabilities about fire safety – Fire safety for students with disabilities is a critical issue that is often overlooked on campuses. This article provides you with information on how you can improve your outreach to these students. New campus fire safety legislation introduced in Congress – Legislation was introduced that will provide for matching grants to schools to develop and deliver campus fire safety education to students throughout their academic career, with a focus on students with disabilities. If you would like to receive Campus Firewatch each quarter you can subscribe online by clicking here. Please be sure to follow us on Facebook, @campusfirewatch and on LinkedIn!